Interfaith leaders gathered in Hillcrest on Tuesday to declare that a local church would become a sanctuary to protect immigrant families at risk of deportation. Leaders at First Unitarian Universalist Church on Front Street said they will begin the process of learning how to support local immigrants and protect families from separation. This coming after the federal announcement to end the Deferred Action for Childhood Arrivals (DACA) program. “We are here to say to Congress, ‘Do your job. 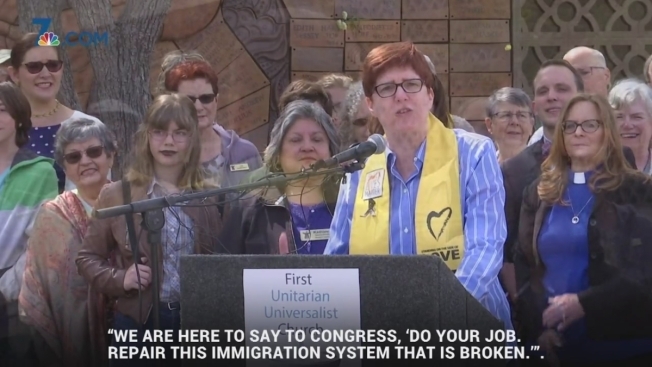 Repair this immigration system that is broken,’” said Reverend Kathleen Owens of the First Unitarian Universalist Church of San Diego. The organizers of the rally Tuesday were there to answer questions about how immigrants can receive sanctuary through the church and the politics of immigration policy. According to ministers at the church, becoming a sanctuary will mean working with immigration attorneys of family members who have a deportation order and are awaiting trial. The church will provide housing, sleeping quarters and showers to families so that they are not separated during that time. Earlier in the week, the congregation voted to become a sanctuary church with 93 percent of the vote in favor. But some on social media disagree with the church's decision. "The bible says to obey man's laws and to be good upstanding people," said Gary Cooper in a Facebook comment. "Sheltering law breakers is doing the opposite." "The church again thinking it is greater than government," Ken Wilson commented.